Be still my beating heart, it's Kilik! He looks real good in that pic you did of him. I do prefer his 2P outfit to the 1P outfit in SC2. I love the details and the pose, as well as the little boxed scene at the top of the picture. Yup. Great stuff, indeed. 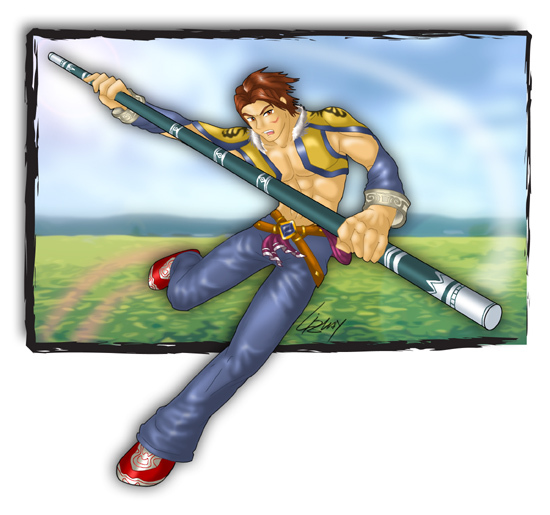 omg kilik!! he was my fave guy!! (cause he was the hottest) lol he kicks arse!! great job with him and the pose this is great!! This is... very far beyond amazing! The details!.... DUDE! Wow! This pic looks so professional!! yea this is an awesome picture..i really wish i could capture the movement like you do!